On August 17 2010, the royal Sun enter into Leo, and stays there for 30 days. The Sun is at home in Leo, since it is the sign ruled by Sun. Whenever a planet transits into its own sign, the energies that the planet emits are extravagant. So, this is the time to channelize the increased vitality in your life for achieving your most important goals. He has two wives, Sanjana and Chhaya. The first one is the daughter of Vishwakarma. After her marriage she found that she could not bear the power of this god’s rays. 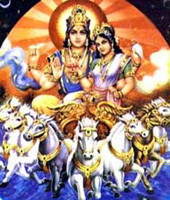 She therefore, made an image of her own, imparted life to it and left it with Surya the Sun god. Later on she turned into mare and was adopted bu Surya again. Wake up every day at least 1 hour before Sun rise and practice Surya namaskaram (Sun salutation exercise) follow by chanting ‘Hmmm Surya Namaha’ mantra 108 times during Sun rise if you want success in every sphere of your life, showers of material comforts and builds your reputation in career. You can also chant or listen to Aditya Hrudayam everyday for this 3o days from August 17 2010.